Christina Victoria Grimmie (March 12, 1994 – June 10, 2016) was an American singer, songwriter, actress, and YouTuber who was known for covering hit songs on YouTube and participating in the NBC singing competition The Voice. In June 2011, she released her debut EP, Find Me. In 2013, she released her studio album, With Love. In 2016, she released her second EP, Side A, and a posthumous release, Side B, was made available on iTunes and Spotify. On June 9, 2017, her second and final album, All Is Vanity, was released posthumously. In 2014, Grimmie was a contestant on season 6 of The Voice and finished in third place. Adam Levine, her coach on the show, announced in the finale that regardless of the results he would sign her to his label 222 Records. Lil Wayne also offered to sign her to his label, Young Money Entertainment. She was signed with Island Records for a short time before being dropped. In 2016, she took on an acting role, making her first and only motion picture appearance in The Matchbreaker. Throughout her career, Grimmie won five awards, including an American Music Award, an iHeartRadio award, and a Teen Choice Award. In 2017, she was posthumously honored with an "Impact Award" from the Humane Society for her animal rights activism. Christina Victoria Grimmie was born to Tina and Albert Grimmie in Marlton, New Jersey, on March 12, 1994. Her mother worked as a receptionist until she was diagnosed with breast cancer; her father worked at Verizon Communications as of 2014[update]. She had an older brother, Marcus (who served as Christina's road manager during her performances). Grimmie was of Italian and Romanian descent and grew up in Marlton, New Jersey, where she attended Bethel Baptist Christian School, Marlton Middle School, and Cherokee High School. Her father noticed Grimmie's talent for singing when she was six years old, and she started playing the piano at age 10. Despite having received piano lessons, Grimmie said she played by ear. Grimmie began posting videos to her YouTube channel in 2009 at age 15, under the username of zeldaxlove64. Grimmie stated that she began a musical YouTube channel so that people could connect with her music, and because her friend persuaded her to post her videos on the popular video sharing website. The first video she uploaded was a cover of Hannah Montana's "Don't Wanna Be Torn". She first earned recognition for her cover of Miley Cyrus's "Party in the U.S.A." in August 2009. Grimmie's covers first gained attention and stood out due to her voice, personality, and interpretations of well-known songs. Grimmie was homeschooled for her junior year of high school in 2010. That same year, she covered Nelly's "Just a Dream" with fellow YouTuber Sam Tsui in a video which received more than 160 million views over the course of eight years, Later, it also became available on iTunes and Spotify. In 2011, she placed No. 2 in the MyYouTube competition, behind Selena Gomez. As her popularity grew on YouTube, Grimmie was discovered in 2014 by Gomez's mother, Mandy Teefey; Teefey and her husband Brian soon became Grimmie's managers. Grimmie performed in the UNICEF charity concert, and also performed backup vocals for Selena Gomez & the Scene; she appeared on the first DigiTour in 2011, which was created specifically for YouTube artists. Gomez became her mentor. Grimmie appeared on the Billboard Social 50; she also opened for Selena Gomez & the Scene, Allstar Weekend and the Jonas Brothers during the Concert of Hope. She toured for six weeks with Selena Gomez & the Scene opening for them in the We Own the Night Tour. She released an EP entitled Find Me, on June 14, 2011. The album was released independently and debuted at number 35 on the Billboard 200 chart in the US. Her debut single "Advice" was released to Radio Disney on June 11, with the music video, directed by Sean Babas, being released on July 19 on her YouTube channel. She appeared on The Ellen DeGeneres Show with fellow YouTuber Tyler Ward, performing a cover to Lil Wayne's "How to Love"; the episode aired on October 10, 2011. On November 20, 2011, Grimmie performed at the 39th American Music Awards of 2011 pre-show alongside Taio Cruz to a special rendition of Higher and also won her first award. She also performed her song "Not Fragile" at the Coca-Cola Red Carpet Show along with Selena Gomez & the Scene. She and the band then appeared together in a commercial for Xbox's Kinect. Grimmie also appeared in a commercial for Doritos that same month. Grimmie was the special musical guest performing her hit song "Advice" on Disney Channel's So Random!, which premiered on December 11, 2011. In January 2012, Grimmie moved to Los Angeles to pursue her singing career; she was signed in April to Creative Artists Agency. On Disney.com, she starred in the web show Power Up: with Christina Grimmie, which ran from March 29, 2012, until June 5, 2012. She also revealed that she would be working with a new band, Rising Tide, a teen group originally from her hometown area in New Jersey. A stripped version of Grimmie's original song "Find Me" was released on ITunes in June 2012, and reached the front page later in July. Though Grimmie's channel mostly focused on covers and original music, she also started pursuing other interests. By April 2013, Grimmie's channel had more than 375 million views and two million subscribers. She then opened for Gomez during the North American leg of her Stars Dance Tour, performing songs from her second album With Love, which was released on August 6, 2013. On October 3, her music video for "Tell My Mama" was given its exclusive premiere on Billboard.com. Grimmie said the video is "about a guy that I start liking in school, and he's sort of a dangerous kid, and I am the type of girl that tells my mom about everything." In January 2014, Grimmie appeared on an episode of the podcast Shane and Friends; Dawson was a friend of Grimmie's. Grimmie auditioned for season 6 of NBC's singing competition, The Voice, as revealed on her Facebook page. She explained that she auditioned to make herself known on a national level, and introduce herself to a broader audience. During the Blind Auditions, she performed Miley Cyrus's hit song "Wrecking Ball". All four coaches, Adam Levine, Usher, Shakira, and Blake Shelton, "turned their chairs" for her; she opted for Adam Levine, after he told her she had the potential to be a "huge star" due to her voice and stage presence, which made her stand out. Selena Gomez supported Grimmie during her audition, and Justin Bieber, an artist Grimmie had frequently covered on YouTube, supported her during the finale. She also performed with Ed Sheeran during the finale. She finished in 3rd place, behind winner Josh Kaufman and runner-up Jake Worthington. Host Carson Daly later said he was "shocked" Grimmie did not win. All of Grimmie's performances were released on iTunes and Spotify as studio versions. During the competition, Grimmie's coach Adam expressed his desire to sign her to his record label, 222 Records; Lil Wayne also showed interest in signing her to Young Money Entertainment. She ultimately chose to sign with Island Records. She toured with previous contestants of The Voice including season 5 winner Tessanne Chin, runner-up Jacquie Lee, Will Champlin, season 1 runner-up Dia Frampton, season 6 winner Josh Kaufman, runner-up Jake Worthington, and fellow season 6 contestants Kristen Merlin and Jake Barker. The Voice Summer tour started on June 21, 2014, in San Antonio, Texas. She was writing and recording music for her sophomore album, her third major release, and first release since being signed to a label. The lead single was expected to be released in July 2014, with the album following later in the year. Grimmie announced via Facebook that filming for the lyric video for the single started on July 6, 2014. On July 11, she announced that her new single would be called "Must Be Love". On July 15, 2014, she announced via a live stream that the song would be released on July 31. "Must Be Love" was produced by Elof Loelv and recorded at ZAC Recording in Atlanta, Georgia. In December 2014, Grimmie returned to The Voice stage to perform and promote her original song "With Love". In February 2015, Grimmie collaborated with Dove Cameron and made a music video for "What A Girl Is", an original song from Cameron's show Liv and Maddie. The music video was released on Grimmie's channel, and Disney's YouTube channel. It was also promoted on the official channel. On March 4, 2015, Grimmie announced that she had been dropped from Island Records and that she was working on a new album set to be released in late 2015. The new single from the album, "Cliché", was released on March 16, 2015. On April 27, Grimmie released her second single, "Stay with Me", a collaboration with Diamond Eyes, which climbed to No. 5 on the iTunes Electronic Charts. The song also was included on 2015 UKF Dubstep, an album showcasing the top dubstep songs of the year. She was also a contestant in the iHeartRadio/Macy's Rising Star Contest. On May 27, 2015, Grimmie was revealed as the winner of the contest, securing her spot to open the 2015 iHeartRadio Music Festival in September. On July 2, 2015, she released her third single, "Shrug". In September 2015, she was one of 16 international artists including Paul McCartney to record the charity single "Love Song to the Earth", which raises climate change awareness. Grimmie then again returned to The Voice for season 9, to promote Kohl's fashion. On February 21, 2016, Grimmie released her second EP, titled Side A, which consisted of four songs. Grimmie said Side B was likely to follow. She had hoped to release a second full-length album by the end of the year. Grimmie had made a four-part video series for Side A comprising "The Ballad of Jessica Blue"; in July 2016, Brian Teefey announced that the videos would debut via Billboard then be featured on her YouTube channel. The first video, for the song "Snow White", debuted on August 11. The second video, for "Anybody's You", debuted on August 18. "Deception" debuted on August 25; "Without Him" on September 1. Grimmie made her motion picture acting debut in The Matchbreaker, directed by Caleb Vetter. The film was released in selected theaters in October 2016 and released digitally in December. Grimmie received her only Teen Choice Award in 2016, winning posthumously for Choice Web Star: Music. It was her third such nomination. The televised ceremony caused backlash among her fans, who said her name was used to promote the show, but never mentioned during the broadcast despite the inclusion of a tribute to victims of gun violence. Her fans also called out the Emmys for excluding Grimmie from their memoriam. On February 17, 2017, Grimmie's family released the posthumous single "Invisible". "Invisible" is part of Grimmie's EP Side B, which was released on April 21, 2017. Following the release of Side B, Grimmie's first posthumous album, All Is Vanity, was released on June 9, 2017. On May 11, 2018, Grimmie's family released another single, "Little Girl," which Grimmie wrote and recorded to support her mother as she battled breast cancer. Grimmie possessed a light-lyric soprano vocal range of three octaves and three notes. In 2014, while on The Voice, Usher called her a "baby Céline Dion". Graham Nash said, "I'm amazed at the range and the control and the depth of her voice. At 20 years old? That's insane." Shakira deemed her high register "out of this world." Grimmie grew up listening to contemporary Christian artist Stacie Orrico: "She has a really awesome voice and I was so drawn to it. I think the reason I do have a soul voice is because I grew up listening to her and she was my huge, huge influence. I wanted to sound just like her, I wrote songs that kinda sounded like something she would do." Grimmie cited Christina Aguilera as her main influence vocally, and listed her favorite singers as Céline Dion, Whitney Houston, and Lady Gaga. She also said she admired Beyoncé for her vocals. She said she liked dubstep and DJ music, as well as rock 'n roll and heavy metal artists Metallica, Pantera, Iron Maiden, and Tool. Grimmie identified as a Christian. Her family attended Fellowship Alliance Chapel in Medford, New Jersey before they moved to Los Angeles. Grimmie had cited her mother, a three-time breast cancer survivor, as a major inspiration for her musical career. On September 2, 2018, Grimmie's mother Tina Grimmie died at the age of 59 after a "courageous and brave battle with breast cancer". Grimmie was an animal rights activist and participated in fundraising events for the Humane Society of the United States. The Christina Grimmie Animal Medical Fund was created in her honor. She also worked with PETA to promote pet adoption, after adopting a dog in 2014. In her honor, she received a leaf on PETA’s Tree of Life, which honors heroes for animals. Grimmie was an anime fan, and had a Twitch channel where she frequently streamed. Grimmie had three tattoos. On June 10, 2016, Grimmie performed with Before You Exit at The Plaza Live in Orlando, Florida. Earlier that day she posted a call out on social media asking people to come to the concert. After their performance ended at 10 P.M., Grimmie signed autographs outside of the main entrance. At 10:24, Grimmie was shot by 27-year-old Kevin James Loibl (March 10, 1989 – June 10, 2016) after initially opening her arms to give him a hug. As witnesses fled the scene, Loibl was tackled by Grimmie's brother, and the men scuffled. Loibl broke free, backed against a wall, and shot himself dead. [lower-alpha 1] Grimmie was on the ground and bleeding from the head; after CPR was performed on her, 911 was called and she was taken to Orlando Regional Medical Center in critical condition with four gunshot wounds;[lower-alpha 2] she was pronounced dead just before 11 P.M. local time. An autopsy revealed that Grimmie was shot once in the head and twice in the chest. Her death was declared a homicide. Dozens of artists and other celebrities took to social media in response to Grimmie's death. The Voice tweeted, "There are no words. We lost a beautiful soul with an amazing voice". [lower-alpha 5] Her former coach, Adam Levine, wrote that he and his wife were "absolutely devastated and heartbroken ... This is yet another senseless act of extreme violence." Blake Shelton wrote "I'm stunned and disgusted and heartbroken that we lost that sweet little girl." Longtime friend and former tour-mate Selena Gomez was performing only a few miles away from Grimmie at the Amway Center when she was shot. The following morning she wrote, "My heart is absolutely broken. I miss you, Christina." Gomez also tearfully dedicated her performance of her song "Transfiguration" to Grimmie's memory at her Miami concert the following night on June 11, and then canceled a meet-and-greet scheduled to take place that night, citing fear and grief. Gomez later checked into rehab and put her tour on hold. Many others dedicated performances to Grimmie. Dove Cameron, who had previously collaborated with Grimmie, expressed her grief over the course of a few days on Twitter. Before You Exit, with whom Grimmie had performed before the shooting, tweeted, "Today we lost an angel, sister, and a beloved friend." The family of the perpetrator of Grimmie's death left a handwritten note on their doorstep offering their condolences and apologies for their son's actions, with "no other comments". Susan Wojcicki, the CEO of YouTube, paid tribute by saying the YouTube family was "heartbroken" and "shocked" to hear of Grimmie's murder, with YouTube officially paying tribute on their website. Many YouTubers made tribute videos for Grimmie, and on June 17, a montage of clips featuring Grimmie titled "In Loving Memory Of Christina Grimmie" was posted on her official YouTube channel, which gained upwards of 2.5 million views and 33,000 comments in the first four days. Songs written and recorded in Grimmie's memory include Tyler Ward's "A Song for Christina"; Before You Exit's "Clouds"; MAX's "Christina's Song" and "Blink of an Eye" by Tori Kelly. In Season 11 of The Voice, the coaches performed "Dream On" at the start of the show, as a tribute to Grimmie. In Season 12, Team Adam performed "Hey Jude" as another tribute to Grimmie; her family was in the audience. Grimmie's Twitter was hacked the morning after her shooting, with the hacker tweeting "The end". The tweet was soon deleted and Grimmie's family took control of her Twitter. YouTuber Onision caused controversy for 'insensitive' comments about Grimmie after her death. Shortly after Grimmie's murder the comments on her YouTube channel were disabled, later becoming enabled again. YouTuber Tana Mongeau sparked outrage in January 2017 when she compared one of her negative fan experiences with Grimmie's murder. On June 11, a GoFundMe was created by Grimmie's manager to cover funeral costs and expenses for the Grimmie family, raising over $170,000 in two days and surpassing its goal of $4,000. It received over 25,000 shares through social media, but soon after, Adam Levine offered to pay for all expenses. [lower-alpha 6] Also, a petition was created on change.org to honor Grimmie, a fan of the video game series The Legend of Zelda, by naming an NPC after her in the upcoming Legend of Zelda game set to be released in 2017. It was signed by over 70,000 people, including her brother Marcus, though nothing ever came of it. Grimmie's death led to calls for increased security at performing arts venues, and also created a discussion about gun control and mental health. American heavy metal band Pantera, noting the similarities between Grimmie's murder and the deaths of former Pantera guitarist Darrell Abbott and three others in 2004, urged concert promoters and club owners to impose stronger measures to protect artists from "gun wielding fanatics. Sadly, that's not the case and another rising star had to pay the consequences with her life." The Plaza Live reopened four days after the shooting, and paid tribute to Grimmie. Management asked Orlando police to help evaluate the club's security. Some singers in Las Vegas—including Cali Tucker, another season six contestant on The Voice—were given escorts after their performances. In California, VidCon added metal detectors and security officers, and banned informal meet-and-greets, in the wake of Grimmie's shooting. [lower-alpha 7] Video personalities including Joey Graceffa were assigned private security. An industry attorney said the extra measures are "expensive, and fans don't like it. But this is the new reality." The Pulse nightclub shooting occurred the night after Grimmie's murder, and also took place in Orlando, Florida; only four miles from where Grimmie was shot. While police confirmed that the two shootings had no connection, Billboard published "An Open Letter to Congress: Stop Gun Violence Now" on June 23 demanding background checks for every gun purchase and an outright ban on sales to suspected terrorists. The inspiration for the letter came from both shootings, and Billboard's editors said the ease with which "dangerous people" can get guns is the one connection between Grimmie's murder and the Pulse shooting. The letter was signed by nearly 200 music industry luminaries, including artists Cher, Jennifer Lopez, Lady Gaga, Britney Spears, Thom Yorke, and surviving Beatles Paul McCartney and Ringo Starr,[lower-alpha 8] and executives Daniel Glass, Irving Azoff, and Russell Simmons. In February 2017, Grimmie's family announced their plans to create a foundation in her honor named "The Christina Grimmie Foundation". [lower-alpha 9] The foundation's purpose is to support those affected by gun violence and/or breast cancer. The foundation frequently hosts events in Grimmie's honor, to ensure that Grimmie's death is "not the end of her story." Later that month, an episode of 48 Hours titled "Stalked" aired focusing on Grimmie's murder. On the second anniversary of Grimmie's murder, the city of Orlando paid tribute, as did the police force. That same month, a podcast titled "Christina Grimmie: The Murder of a Rising Star" was released, with separate episodes all focusing on key components of her murder. After the Jacksonville Landing shooting occurred in August 2018, BBC News compared Grimmie's murder with it, along with other shootings that had occurred in Florida. In December 2016, six months after her murder, Grimmie's family filed a wrongful-death lawsuit against several entities, including the concert promoter, the foundation that owns the venue, and the security company working the event. In January 2017, the venues requested that the judge dismiss the lawsuit, claiming Florida law does not allow business owners to be held liable for attacks on their property. A hearing on the motion to dismiss the lawsuit was set for May 23. The lawsuit was dismissed but Grimmie's family was given an opportunity to re-file the suit. The judge stated that the suit did not make enough of a distinction between the concert promoter and the venue owner. In May 2017, the family's attorney, Brian Caplan, said that Grimmie's family will file a new complaint after a Florida judge dismissed the original lawsuit. On April 9, 2018, just short of a year after the Grimmie family filed a new complaint in a Florida court, it was revealed that a judge rejected the defendants' AEG Live and the Orlando Philharmonic Orchestra Plaza Foundation motions to dismiss the case, and has allowed the family's lawsuit to move forward. In their lawsuit the Grimmie family alleges that the defendants "failed to take adequate security measures to ensure the safety of the performers and the attendees at the concert venue." Grimmie's family is also being allowed to move forward on claims of "negligent infliction of emotional distress". The judge determined more research on the claims is needed before going forward. No time frame has been given on the next steps in the case or when a decision would be reached. "Wrecking Ball (The Voice Performance)"
"I Knew You Were Trouble (The Voice Performance)"
"Counting Stars (The Voice Performance)"
"I Won't Give Up (The Voice Performance)"
"Dark Horse (The Voice Performance)"
"Hold On, We're Going Home (The Voice Performance)"
"How to Love (The Voice Performance)"
"Hide and Seek (The Voice Performance)"
"Some Nights (The Voice Performance)"
"Can't Help Falling in Love (The Voice Performance)"
"Somebody That I Used to Know (The Voice Performance)"
"—" denotes items which did not chart. ↑ Police later called Marcus Grimmie "heroic" and said his actions "could have prevented [additional] loss of life there". ↑ "Christina suffered a gunshot wound to the side of her head. ... This wound was fatal. Christina also suffered three gunshot wounds to her torso." ↑ The second handgun was found on the floor at the venue; the head of security told police that a misfeed had kept it from firing. Whether Loibl had attempted to use it during the crime was not stated. ↑ Loibl's phone was encrypted, and the hard drive from his computer had been destroyed. ↑ On June 28, The Voice released the video "With Love: A Tribute to Christina Grimmie", featuring reminiscences from fellow contestants including Will Champlin, Delvin Choice, Jacquie Lee and Kat Perkins. On August 21, NBC broadcast a post-Olympics preview episode of The Voice dedicated "in loving memory of our friend Christina Grimmie." During the episode broadcast on April 25, 2017, the Christina Grimmie Foundation was officially launched and Team Adam dedicated its performance of "Hey Jude" to Grimmie. ↑ Levine paid for Grimmie's funeral. ↑ Grimmie had been a featured performer at VidCon, and its June 2016 event in Anaheim featured a video tribute to the fallen singer, after which event hosts John and Hank Green tearfully asked the audience for a round of applause for Grimmie. ↑ Bandmate John Lennon was shot and killed by a "deranged fan" in 1980. ↑ The Christina Grimmie Foundation was officially launched in April. 1 2 3 Bendlin, Karli (June 17, 2016). "Christina Grimmie Buried In Her Beloved New Jersey Hometown". The Huffington Post. Retrieved June 17, 2016. 1 2 Terruso, Julia (May 19, 2014). "For South Jersey's Christina Grimmie, 'The Voice' is a dream come true". The Philadelphia Inquirer. Retrieved June 14, 2016 – via Philly.com. 1 2 Dineen, Caitlyn (June 11, 2016). "Motives still unknown in slaying of singer Christina Grimmie". Orlando Sentinel. Retrieved June 11, 2016. ↑ zeldaxlove64 Christina Grimmie (July 31, 2013). "LIVE Q&A Listening Party w/Surprise! 4PM PST". YouTube. Retrieved August 7, 2013. ↑ "Academics". Baptist Regional School. Retrieved December 11, 2016. ↑ Wood, Steve (May 5, 2014). "S.J. native shines on The Voice". Courier-Post. South Jersey. Retrieved June 11, 2016. ↑ "More than 1,000 mourn at N.J. vigil for Christina Grimmie". June 14, 2016. Retrieved December 11, 2016. 1 2 Linnehan, Robert (January 26, 2011). "Marlton singer taking her talents to L.A." (PDF). The Marlton Sun. p. 2. Archived from the original (PDF) on November 9, 2013. Retrieved April 12, 2013. 1 2 Levy, Mallory (June 10, 2011). "Exclusive Interview with Christina Grimmie". Joonbug.com. Retrieved April 12, 2013. ↑ "About". ChristinaGrimmie.com (official website). Archived from the original on September 1, 2014. Retrieved April 12, 2013. ↑ ParentHerald (June 12, 2016). "YouTube Star Christina Grimmie (zeldaxlove64) Shot Dead After Concert in Florida". Parent Herald. ↑ LaCroix, Emy (October 5, 2016). "Christina Grimmie Tribute: Shane Dawson Breaks Down In Tears At Streamy Awards". ↑ "The Christina Grimmie Foundation Selects YouTube As Its Legacy Award Recipient". Cision. September 19, 2018. Retrieved March 18, 2019. ↑ Staff (May 20, 2014). "7 things you need to know about local Voice finalist Christina Grimmie". The Philadelphia Inquirer. Retrieved June 17, 2016 – via Philly.com. ↑ Grace Gavilanes (September 2, 2018). "In Memory of a True Talent: 8 of Christina Grimmie's Best YouTube Covers". People. Retrieved March 18, 2019. ↑ "7 Things I Loved Most About Christina Grimmie". The Odyssey Online. 2016-06-14. Retrieved 2018-12-18. ↑ goomradio (August 19, 2010). "Christina Grimmie Interview on Goom Radio". YouTube. Retrieved April 12, 2013. ↑ Schneider, Kurt Hugo (November 20, 2010). ""Just A Dream" by Nelly – Sam Tsui & Christina Grimmie". YouTube. Retrieved June 17, 2016. Grimmie, Christina (November 20, 2010). ""Just A Dream" by Nelly – Sam Tsui & Christina Grimmie". YouTube. Retrieved June 17, 2016. ↑ Lyons, Beverley (March 4, 2015). "Voice USA pop sensation Christina Grimmie on why she won't get undressed to impress". Daily Record. Retrieved December 21, 2016. ↑ Geffen, Sasha (June 13, 2016). "Looking Back On Selena Gomez and Christina Grimmie's Lasting Friendship". MTV News. Retrieved June 13, 2016. ↑ Peel, Sarah (October 30, 2010). "Christina Grimmie UNICEF Performance – Selena Gomez Introduction". BSCkids.com. Archived from the original on March 20, 2012. Retrieved May 29, 2012. ↑ "Christina Grimmie Opens for Selena Gomez Tonight!". Fanlala.com. October 26, 2010. Archived from the original on March 15, 2012. Retrieved May 29, 2012. ↑ Caulfield, Keith (January 13, 2011). "A Canoodling Justin Bieber Bullets to No. 1 on Social 50 Chart; Snoop's 'Wet' Rise; Christina Grimmie YouTube Phenom". Billboard. Retrieved February 21, 2011. 1 2 Staff (June 2, 2011). "Exclusive Interview: Christina Grimmie". Seventeen. Retrieved June 13, 2016. ↑ "YouTube Star Christina Grimmie Hits Three New Charts". Billboard. ↑ "MAJOR UPDATE! Album on June 13th Dudes!!". YouTube. Retrieved May 21, 2012. ↑ "Christina Grimmie Performs 'How to Love' – The Ellen DeGeneres Show". Ellen.warnerbros.com. Archived from the original on October 12, 2011. Retrieved May 21, 2012. ↑ joshuajcohen (November 14, 2011). "Exclusive: DeStorm, Christina Grimmie, Karmin Get AMA Honors". ↑ Cheung, Nadine (November 11, 2011). "Selena Gomez and the Scene Star in New Xbox Kinect Commercial With Christina Grimmie". Cambio. Retrieved June 15, 2016. ↑ "Christina Grimmie Performs On 'So Random!'". ClevverTV. December 7, 2011. Archived from the original on May 14, 2012. Retrieved May 21, 2012. ↑ Kaur, Jaskiran (February 27, 2014). "The Voice 2014: Christina Grimmie Talks about Blind Audition; Things to Know ..." Archived from the original on October 9, 2014. Retrieved June 11, 2016. ↑ "Find Me (Stripped)". amazon.com. Retrieved 2018-12-18. ↑ Devoe, Noelle (2016-06-17). "Christina Grimmie's Final YouTube Video is a Beautiful Montage of Her Most Inspiring Moments". Seventeen. Retrieved 2018-12-18. ↑ Staff (May 22, 2013). "Christina Grimmie Will Join Selena On Her 'Stars Dance' Tour!". Archived from the original on May 22, 2015. Retrieved June 11, 2016. ↑ Lipshutz, Jason (October 3, 2013). "Christina Grimmie, "Tell My Mama": Exclusive Video Premiere". Billboard.com. Retrieved June 11, 2016. ↑ Friends, Shane And. "Youtube Star Christina Grimmie - Shane And Friends - Ep. 18 – Shane And Friends – Podcast". Podtail. Retrieved 2018-12-30. ↑ "Christina Grimmie on Facebook". Retrieved May 3, 2015. 1 2 "Watch Christina Grimmie's Audition for 'The Voice'". Time. Retrieved 2018-12-20. ↑ Gomez, Selena (2014-02-24). ". @TheRealGrimmie what an amazing performance tonight on @NBCTheVoice so proud of how far you have come. Excited to see you go all the way". @selenagomez. Retrieved 2018-12-21. ↑ Wagmeister, Elizabeth (2014-05-20). "'The Voice': Justin Bieber Wants Christina Grimmie To Win". Hollywood Life. Retrieved 2018-12-18. ↑ "Ed Sheeran rocks 'The Voice'; sings 'All of the Stars' with Christina Grimmie". AXS. Retrieved 2018-12-18. ↑ Romano, Nick (June 11, 2016). "The Voice: Remembering season 6 contestant Christina Grimmie". Entertainment Weekly. Retrieved June 15, 2016. ↑ "The Voice's Carson Daly: Christina Grimmie Was Incredible". E! Online. June 11, 2016. Retrieved 2019-01-09. 1 2 "Wrecking Ball (The Voice Performance) - Single". iTunes. January 1, 2014. Retrieved June 16, 2018. ↑ "I Knew You Were Trouble (The Voice Performance)". amazon.com. Retrieved 2019-01-09. ↑ "I Won't Give Up (The Voice Performance) - Single". iTunes. January 1, 2014. Retrieved June 16, 2018. ↑ "Dark Horse (The Voice Performance) - Single". iTunes. January 1, 2014. Retrieved June 16, 2018. ↑ "Hold On, We're Going Home (The Voice Performance) - Single". iTunes. January 1, 2014. Retrieved June 16, 2018. ↑ "How To Love (The Voice Performance) - Single". iTunes. January 1, 2014. Retrieved June 16, 2018. ↑ "Hide and Seek (The Voice Performance) - Single". iTunes. May 12, 2014. Retrieved June 16, 2018. ↑ "Some Nights (The Voice Performance) - Single". iTunes. May 12, 2014. Retrieved June 16, 2018. ↑ "Somebody That I Used To Know (The Voice Performance) - Single". iTunes. January 1, 2014. Retrieved June 16, 2018. ↑ "Can't Help Falling In Love (The Voice Performance) - Single". iTunes. January 1, 2014. Retrieved June 16, 2018. ↑ "NBC's 'The Voice' alum Christina Grimmie signs with Island Records". July 4, 2014. Retrieved May 3, 2015. ↑ "Ever-evolving Christina Grimmie working on 'Voice' tour, new music". July 4, 2014. Retrieved May 3, 2015. ↑ "Christina Grimmie "Must Be Love" (Official Lyric Video Premiere)". Archived from the original on July 18, 2014. Retrieved May 3, 2015. ↑ ""Must Be Love" In Studio – A Sneak Peak at the NEW Single (Coming July 31st)". Retrieved May 3, 2015. ↑ "Christina Grimmie returns to 'The Voice' with latest single 'With Love'". AXS. Retrieved 2018-12-18. 1 2 Disney, Oh My (2015-03-15). "Dove Cameron, Christina Grimmie, and Baby Kaely Show You What a Girl Is | Disney Playlist". Oh My Disney. Retrieved 2018-12-18. ↑ "Voice USA pop sensation Christina Grimmie on why she won't get undressed to impress". March 4, 2015. Retrieved May 3, 2015. ↑ "Instagram". Retrieved September 8, 2015. ↑ "UKF Dubstep 2015 (Album Mix)". ↑ "Christina Grimmie". Macy's iHeartRadio Rising Star. Archived from the original on September 8, 2015. Retrieved September 8, 2015. ↑ Mitchell, Gail (September 3, 2015). "Paul McCartney, Jon Bon Jovi & More Sing a 'Love Song to the Earth' to Support Climate Action". Billboard. Retrieved June 15, 2016. ↑ "Christina Grimmie for KOHL'S + THE VOICE – Audrey Brianne". Retrieved 2018-12-29. ↑ Ramanand, Liz (June 7, 2016). "Singer Christina Grimmie Talks 'Side A,' 'The Voice' + More [Interview]". PopCrush. Retrieved June 15, 2016. ↑ Lujan, Adam (July 25, 2016). "Christina Grimmie's final music videos to be released next month". Entertainment Weekly. Retrieved July 25, 2016. ↑ Stutz, Colin (August 11, 2016). "Watch Christina Grimmie's 'Snow White' Video From Posthumous 'Side A' Visual EP: Exclusive Premiere". Billboard. Retrieved August 11, 2016. ↑ McConiga, Rimsie (October 11, 2016). "Q5: Filmmaker's new movie to open at Landing 4". Leavenworth, Kansas: Leavenworth Times. Retrieved October 29, 2016. ↑ Pennacchio, George (October 5, 2016). "Christina Grimmie remembered during The Matchbreaker premiere". Los Angeles: KABC-TV. Retrieved October 29, 2016. ↑ Yahr, Emily (August 1, 2016). "Christina Grimmie won a Teen Choice Award but wasn't mentioned on the show. Fans aren't happy". The Washington Post. Retrieved August 1, 2016. ↑ "Christina Grimmie Fans Upset She Was Left Out of Emmy Awards' 'In Memoriam' Segment". Billboard. Retrieved 2019-01-07. 1 2 Peters, Mitchell (February 18, 2017). "Christina Grimmie's Family Releases New Song 'Invisible': Listen". Billboard. Retrieved February 27, 2017. ↑ Kreps, Daniel (February 19, 2017). "Hear Christina Grimmie's Inspiring New Song 'Invisible'". Rollingstone. Retrieved February 27, 2017. ↑ "Posthumous Christina Grimmie Album Announced". ew.com. ↑ "Christina Grimmie on Instagram: "IMPORTANT UPDATE: #TeamGrimmie, due to circumstances beyond our control, the release date for "All Is Vanity" has been moved to June 9th.…"". Instagram. ↑ Enos, Morgan (May 11, 2018). "Christina Grimmie's Family Releases Touching New Song 'Little Girl' For Mother's Day". Billboard. Lynne Segall. Archived from the original on May 11, 2018. Retrieved May 12, 2018. ↑ "Vocal Profile and Range: Christina Grimmie". Critic of Music. August 11, 2013. Retrieved June 15, 2016. ↑ Yahr, Emily (June 13, 2016). "This is why Christina Grimmie stood out on The Voice, above the thousands who audition". The Washington Post. Retrieved June 15, 2016. ↑ WFTV-Orlando. "9 facts about Christina Grimmie". ajc. Retrieved 2019-01-21. ↑ jgardiner (May 24, 2011). "Christina Grimmie: A Real Depiction Of A Jersey Shore Native (EXCLUSIVE)". GlobalGrind. pp. 4–5. Retrieved June 21, 2016. ↑ Sands, Nicole; Chiu, Melody (June 14, 2016). "Christina Grimmie 'Had the Biggest Heart Known to Mankind' When It Came to Her Fans, Says Close Friend Bria Kelly". People. Retrieved June 14, 2016. ↑ Show Me Space (February 10, 2015). "Christina Grimmie sings 'Wrecking Ball' The Voice Highlight Blind Auditions" – via YouTube. ↑ Elizabeth, De. "Christina Grimmie's Mother Has Passed Away". Teen Vogue. Retrieved 2018-12-18. ↑ Spangler, Todd (June 16, 2016). "Christina Grimmie's Team Wins $250,000 Prize for Humane Society". Variety. Retrieved July 11, 2016. ↑ "Christina Grimmie peta2 PSA". peta2. 2014-05-16. Retrieved 2018-12-18. ↑ "Christina Grimmie, Hero for Animals, Dies at 22". peta2. 2016-06-11. Retrieved 2018-12-18. ↑ Green, Scott. ""Tokyo Ghoul" Author Pays Tribute To Slain Singer Christina Grimmie". Crunchyroll. Retrieved 2018-12-18. ↑ "Christina Grimmie's Clothes & Fashion". Steal Her Style. Retrieved 2018-12-19. 1 2 Grimmie Investigative Supplement 2016, p. 2. ↑ Grimmie Investigative Supplement 2016, p. 3. ↑ "Christina Grimmie greeted gunman 'with arms open' for hug before her murder". The Independent. 2016-06-12. Retrieved 2018-12-19. ↑ "Forgotten story of Christina Grimmie and the man who killed her". Courier-Post. Retrieved 2018-12-19. 1 2 Tziperman Lotan, Gal (June 22, 2016). "Police: Man who killed singer Christina Grimmie was 'infatuated' with her". Orlando Sentinel. Retrieved June 22, 2016. ↑ Bond, Anthony (2016-06-11). "Witness to Christina Grimmie murder says there 'was blood everywhere'". mirror. Retrieved 2018-12-19. ↑ Grimmie Investigative Supplement 2016, p. 6. 1 2 Dendy, Michelle (June 22, 2016). "Friend: Shooter had fixation on 'The Voice' singer". WKMG-TV. Retrieved June 22, 2016. ↑ "Christina Grimmie Autopsy Report" (PDF). Autopsyfiles. Retrieved January 16, 2019. ↑ "Gunman Who Killed 'The Voice' Singer Had Extra Ammo, Knife: Police". NBC News. Retrieved 2018-12-19. 1 2 3 Weiner, Jeff. "Listen to 'Christina Grimmie: The Murder of a Rising Star' | Episode 2 - A Loner's Obsession now released". OrlandoSentinel.com. Retrieved 2019-01-06. ↑ CNN, Boris Sanchez, Ralph Ellis, Joe Sutton and Azadeh Ansari. "Police ID man who killed singer Christina Grimmie". CNN. ↑ "UCF alumna recounts Christina Grimmie shooting". Central Florida Future. Retrieved 2019-02-04. ↑ "She Greeted Him with 'Her Arms Open Wide,' Says Concertgoer Who Stood Behind Gunman Before He Opened Fire on Christina Grimmie". Long Room. Retrieved 2018-12-19. ↑ Winsor, Morgan (2016-06-11). "Suspect Came to Orlando to Shoot Christina Grimmie, Police Say". ABC7 San Francisco. Retrieved 2018-12-20. ↑ News, A. B. C. (2016-06-13). "Suspect Came to Orlando Concert to Shoot Christina Grimmie, Police Say". ABC News. Retrieved 2018-12-19. ↑ "Singer Christina Grimmie's killer had 'history of violence'". hindustantimes.com. 2016-06-14. Retrieved 2018-12-19. ↑ "Christina Grimmie's Killer Was Obsessed, Lived "Like A Hermit," Police Say". BuzzFeed News. Retrieved 2018-12-19. ↑ Lotan, Gal Tziperman. "Police: Man who killed singer Christina Grimmie was 'infatuated' with her". OrlandoSentinel.com. Retrieved 2018-12-19. ↑ NJ.com, NJ Advance Media for. "Christina Grimmie murder: 6 findings from police investigation". NJ.com. Retrieved 2018-12-19. ↑ Pocklington, Rebecca (2016-06-14). "Fans link disturbing online messages to crazed fan who killed Christina Grimmie". mirror. Retrieved 2019-01-05. ↑ Staff (June 18, 2016). "Thousands say farewell to slain Voice singer Christina Grimmie". Toronto Star. Associated Press. Retrieved June 18, 2016. ↑ Staff (June 11, 2016). "Adam Levine, Blake Shelton & More Stars React to Voice Alum Christina Grimmie's Death". Billboard. Retrieved July 25, 2016. ↑ "Former Voice contestant Christina Grimmie shot dead in Orlando". BBC News. June 11, 2016. Retrieved June 11, 2016. ↑ Barker, Jake; Perkins, Kat; Kelly, Bria et al. (June 28, 2016). With Love: A Tribute to Christina Grimmie (video). YouTube: The Voice (official channel). e7YzM8oYCCM. Retrieved June 28, 2016. ↑ Brucculieri, Julia (August 22, 2016). "The Voice Judges Kick Off Season 11 With Powerhouse Performance Of 'Dream On'". The Huffington Post. Retrieved August 23, 2016. 1 2 Kumari Upadhyaya, Kayla (April 25, 2017). "The Voice: Top 11 Revealed". The Hollywood Reporter. Retrieved April 25, 2017. ↑ Heller, Corinne (June 11, 2016). "Christina Grimmie Shot Dead at 22: The Voice Family and Other Stars Pay Tribute". E! News. Retrieved June 11, 2016. ↑ "Magic 107.7". facebook.com. Retrieved 2018-12-21. ↑ Romano, Nick (June 11, 2016). "Selena Gomez responds to Christina Grimmie's death: 'My heart is broken'". Entertainment Weekly. Retrieved June 11, 2016. ↑ "Selena Gomez Honors Christina Grimmie in Miami: 'I Don't Really Understand How This Really Happened'". Billboard. Retrieved 2018-12-19. ↑ "Are YouTubers REALLY Safe At Their Own Meet And Greets?". PopBuzz. Retrieved 2018-12-19. ↑ "Christina Grimmie's Murder Sent Selena Gomez 'Spiraling' Into Drug Abuse". RadarOnline. 2016-08-31. Retrieved 2018-12-21. ↑ "Singers Pay Emotional Tributes to Christina Grimmie in Concert". E! Online. June 12, 2016. Retrieved 2018-12-19. ↑ "Justin Bieber Pays Tearful Tribute to Christina Grimmie on Stage". Billboard. Retrieved 2018-12-19. ↑ "Demi Lovato and Nick Jonas Honor Orlando Nightclub Shooting Victims". Time. Retrieved 2018-12-20. ↑ Devoe, Noelle (2016-06-14). "Dove Cameron Opens Up About Struggling With Grief After the Orlando Shootings". Seventeen. Retrieved 2018-12-20. ↑ Chiu, Melody (June 11, 2016). "Christina Grimmie Shot Dead After Concert with Before You Exit: 'Today We Lost an Angel, Sister and a Beloved Friend', Says Band". People. Retrieved June 11, 2016. ↑ "Update: Christina Grimmie shooter, his family leaves note". CW39 Houston. 2016-06-12. Retrieved 2018-12-19. 1 2 Koerber, Brian. "YouTube CEO Susan Wojcicki shares heartfelt thoughts on Christina Grimmie". Mashable. Retrieved 2019-01-07. ↑ YouTube (2016-06-11). "Remembering Christina Grimmie with some of her most moving performances". @YouTube. Retrieved 2019-02-11. ↑ "Stalked: Part Two". CBS News (transcript). February 25, 2017. Retrieved February 25, 2017. ↑ Norton, Jessica (December 16, 2016). "Christina Grimmie Gets Honored In New Heart-wrenching Before You Exit Song". MTV. Retrieved February 27, 2017. ↑ Benjamin, Jeff (June 28, 2016). "MAX OPENS UP ABOUT CHRISTINA GRIMMIE TRIBUTE 'CHRISTINA'S SONG,' MEMORIES OF THE STAR: INTERVIEW". Fuse. Retrieved 15 December 2017. ↑ Iasimone, Ashley (July 10, 2016). "Tori Kelly Writes Emotional Song 'Blink of an Eye' for Christina Grimmie: Listen". Billboard. Retrieved July 11, 2016. ↑ Johnson, Daniel K. N.; Gleason, Tracy R. (2005). "Who REALLY Wants To Be A Millionaire: Game Show Contestant Behavior Under Risk". doi:10.2139/ssrn.847848. ISSN 1556-5068. ↑ "Adam Levine honors Christina Grimmie with moving performance on 'The Voice'". USA TODAY. Retrieved 2018-12-20. ↑ "Christina Grimmie's agent says her Twitter account was hacked". Mail Online. 2016-06-11. Retrieved 2019-01-07. ↑ "Onision Slammed for 'Insensitive' Christina Grimmie Tweets - Superfame". superfame.com. 2016-06-11. Retrieved 2019-01-07. ↑ Li, Karen (2017-02-08). "Racism, White Privilege, and White guilt". applied intersectionality. Retrieved 2019-01-07. ↑ "Christina Grimmie's family's GoFundMe campaign raises $125,000 in two days". EW.com. Retrieved 2018-12-20. ↑ "Adam Levine Offers to Pay for Christina Grimmie's Funeral". Entertainment Tonight. Retrieved 2018-12-20. ↑ "Nintendo Responds to Petition for Christina Grimmie in Zelda". Time. Retrieved 2018-12-20. ↑ Perishable. "Negligent Security: Is Plaza Live Responsible for Death of Christina Grimmie". Florida Justice. Retrieved 2019-01-06. ↑ Roberts, Edward (2016-06-11). "Christina Grimmie fans demand guns be BANNED after star's fatal shooting". mirror. Retrieved 2018-12-19. ↑ "Christina Grimmie's murder shines light on the dark side of celebrity: deranged fans". The Independent. 2016-06-12. Retrieved 2018-12-19. ↑ Kaufman, Gil (June 13, 2016). "Pantera Calls On Club Owners & Promoters to Beef Up Artist Security After Christina Grimmie Murder". Billboard. Retrieved June 13, 2016. ↑ Korn, Jennifer Ortega, Loren (2016-06-17). 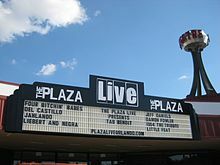 "The Plaza Live reopens after singer fatally shot". WKMG. Retrieved 2018-12-19. ↑ Cridlin, Jay (June 15, 2016). "Orlando's Plaza Live to resume concerts following Christina Grimmie shooting". Tampa Bay Times. Archived from the original on June 16, 2016. Retrieved June 15, 2016. ↑ Elfman, Doug (June 17, 2016). "Vegas entertainers receive more protection after Christina Grimmie's death". Las Vegas Review-Journal. Retrieved June 18, 2016. ↑ Jarvey, Natalie (June 13, 2016). "Voice Singer & YouTuber Christina Grimmie's Murder Prompts Tighter VidCon Security". Billboard. Retrieved June 13, 2016. ↑ Nolfi, Joey (June 27, 2016). "VidCon pays emotional tribute to Christina Grimmie". Entertainment Weekly. Retrieved June 27, 2016. ↑ Pierson, David (June 18, 2016). "Christina Grimmie's murder is shaking the bond between fans and YouTube stars". Los Angeles Times. Retrieved June 18, 2016. ↑ Gensler, Andy; Waddell, Ray (June 13, 2016). "'This Is the New Reality': Artists & Concert Execs Weigh In on Security Challenges After Orlando". Billboard. Retrieved June 13, 2016. ↑ News, A. B. C. (2016-06-14). "Christina Grimmie's Brother Speaks Out at Slain Sister's Vigil". ABC News. Retrieved 2018-12-19. ↑ Warner, Claire. "Is The Pulse Shooting Linked To Christina Grimmie?". Bustle. Retrieved 2018-12-19. ↑ Staff (February 9, 1981). "Lennon shot on way to see son". Toronto, Ontario, Canada. Associated Press. Retrieved 28 September 2016 – via Toronto Star. ↑ Editors (June 23, 2016). "An Open Letter to Congress from the Music Industry". Billboard. Retrieved June 23, 2016. Goodman, Jessica (June 23, 2016). "Katy Perry, Britney Spears, Billy Joel, more sign open letter to Congress about gun safety". Entertainment Weekly. Retrieved June 23, 2016. ↑ "Christina Grimmie's death not the end of her story". Courier-Post. Retrieved 2018-12-19. ↑ Gray, Ellen. "'48 Hours' report on stalkers features case of Marlton's Christina Grimmie". philly.com. Retrieved 2019-01-06. ↑ Garza, Lisa Maria. "Orlando remembers slain singer Christina Grimmie with intimate vigil, social media tributes". OrlandoSentinel.com. Retrieved 2018-12-20. ↑ Weiner, Jeff. "Listen to 'Christina Grimmie: The Murder of a Rising Star' podcast. Episode 1 - A Dream Derailed now released". OrlandoSentinel.com. Retrieved 2018-12-20. ↑ "Video gamer kills two at Florida event". BBC News. 2018-08-27. Retrieved 2019-01-06. ↑ Stutz, Colin (December 20, 2016). "Christina Grimmie's Family Files Lawsuit Against AEG Live, Orlando Venue Over Singer's Death". Billboard. Retrieved December 21, 2016. ↑ Hayes, Christal (January 28, 2017). "Venue: Christina Grimmie's brother voluntarily tackled gunman, isn't eligible for cash in lawsuit". Orlando Sentinel. Retrieved January 29, 2017. ↑ "Christina Grimmie Dead – Wrongful Death Trial Date Set". Radar Online. March 28, 2017. Retrieved April 2, 2017. ↑ Lotan, Gal Tziperman. "Judge asks for amended complaint in Christina Grimmie wrongful death case". OrlandoSentinel.com. ↑ "Christina Grimmie's family to refile wrongful death lawsuit after dismissal". Fox News. 2017-05-24. Retrieved 2018-05-29. ↑ "Judge Rejects AEG's Bid to Dismiss Lawsuit Over Christina Grimmie's Death". The Hollywood Reporter. Retrieved 2018-05-29. ↑ "Christina Grimmie's Family Allowed To Proceed With Lawsuit Against AEG Live | iHeartRadio". iHeartRadio. Retrieved 2018-05-29. ↑ "So Random! Season 1 Episode 19". IMDb. Retrieved March 18, 2019. ↑ "Christina's gaming webshow "Power Up" by Disney". zeldaxlove64. Retrieved March 18, 2019. ↑ DS2DIO. "REMIXED: KEONE MADRID & MARI MARTIN & CHRISTINA GRIMMIE [DS2DIO]". YouTube. Retrieved March 18, 2019. ↑ "Dancing with the Stars Week 4: The Results Season 15 Episode 8". IMDb. Retrieved March 18, 2019. ↑ "Dancing with the Stars Semi-final Results Season 16 Episode 18". IMDb. Retrieved March 18, 2019. ↑ "Dancing with the Stars Plugged/Unplugged Night (Semifinals) Season 19 Episode 12". IMDb. Retrieved March 18, 2019. ↑ "TakePart Live Season 3 Episode 82". IMDb. Retrieved March 18, 2019. ↑ Christina Grimmie (December 31, 2014). "Honored to sing the National Anthem for the Orange bowl tonight....! HAPPY NEW YEAR EVERYONE(:". Twitter. Retrieved March 18, 2019. ↑ "Drama King Truth or BURGER? : Nicki Minaj's "Feeling Myself" Music Video Game Season 3 Episode 8". IMDb. Retrieved March 18, 2019. ↑ "Teens Wanna Know Attack on Titan World Premiere w Kiko Mizuhara, Shinji Higuchi, Christina Grimmie, Carl Weathers Season 4 Episode 16". IMDb. Retrieved March 18, 2019. ↑ "VIP For a Day IHeartRadio Music Festival 2015 Season 1 Episode 4". IMDb. Retrieved March 18, 2019. ↑ Amanda N'Duka (September 22, 2016). "'The Matchbreaker,' Starring Late 'The Voice' Singer Christina Grimmie, Set For October Release". Deadline Hollywood. Retrieved March 18, 2019. 1 2 "Christina Grimmie – Chart history". Retrieved May 3, 2015. ↑ "Christina Grimmie – Chart history". Retrieved May 3, 2015. ↑ "Discografie Christina Grimmie". Retrieved May 3, 2015. ↑ Platten, Rachel. "SO excited that @hunterhunted123 + @therealgrimmie will be joining me on my #WILDFIRE tour!". Twitter. Retrieved December 28, 2015. Orlando Police Department (June 22, 2016). "Grimmie Investigative Supplement" (PDF). CNN. Cited as Grimmie Investigative Supplement 2016. Wikimedia Commons has media related to Christina Grimmie. Christina Grimmie Podcast: The Murder of a Rising Star. Orlando Sentinel Podcast Series.